Use of the Google search term “Cloud Computing” started to grow in 2007 and peaked in 2011. 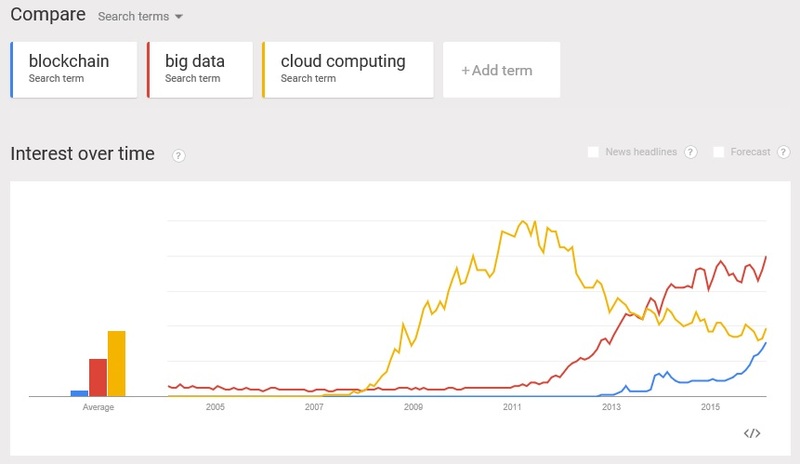 Since then its use has tailed off and in mid-2013 the term “Big Data” overtook it. Big Data continues to grow, albeit much more slowly and may have now plateaued. 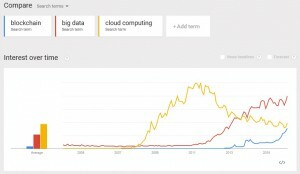 It now looks like Blockchain will soon also overtake the use of the term Cloud Computing. Whilst tracking Google searches may be a limited proxy for interest in a technology it is however still of value as a way of eliciting the general trend. Could this be a useful lens to view the hype cycle of these three technologies ? It’s certainly interesting to see that the steepness of the curve when each of the terms came into use differs. Perhaps surprisingly, it was Cloud Computing that ramped up fastest. So, maybe we’re nowhere near Peak Blockchain yet! Will 2017 be the year that Blockchain is Regulated ? Blockchain? …..#DYOR – Beware of Scams! Blockchain vs Distributed Ledger ?